Those beautiful clusters of red, purple, pink, and white radishes are known as Easter egg radishes. 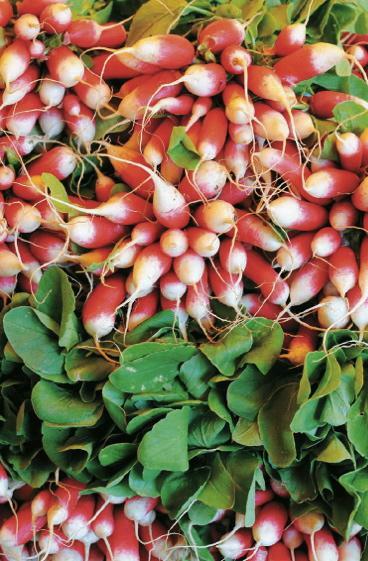 French breakfast radishes are elongated with a red top fading to a white tip. They are mildly peppery. White icicle radishes, on the other hand, have a similar shape but a strong bite. Daikon radishes are long, like carrots, sometimes even bigger than carrots, and very, very mild. Black radishes have a thick, rough black skin and a white interior and are slightly less peppery than your average red globe. 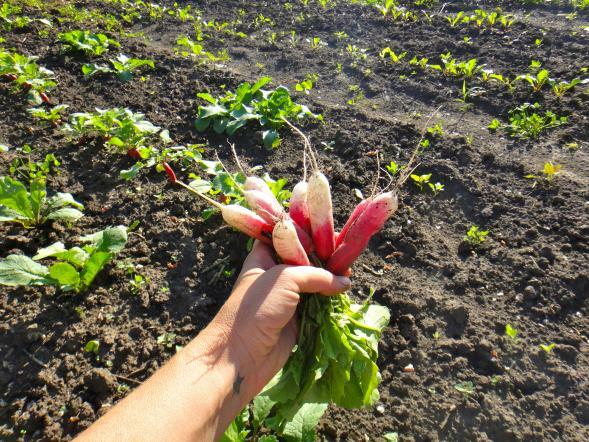 The flavor of all of these radishes, however, is affected by the weather, getting sharper as it gets hotter. What do most people do with radishes? Pretty much one thing: They eat them raw. Maybe sliced, maybe in a salad. Maybe carved into roses and arranged around a vegetable platter. That’s it. But radishes are transformed when you roast them. They get sweet and crisp and nutty. French breakfast radishes are especially good when roasted (twenty minutes at 400 degrees F will do the trick) and then bathed in salted butter. Radish tops are, indeed, edible, but they often look in rough shape because radishes aren’t often bred for their tops. If the tops are sunburnt, bruised, tough, or very, very limp, give them a pass. But if they look like they’re in good shape, you’re in for a treat. Radish greens have a strong peppery flavor and will make a powerful pesto, or can be stirred into soup to give it a kick. If you sauté your radishes, add the tops halfway through cooking for a double-radish dish. Baby radish greens are often found in salad mixes; however, once they’re mature, they are a little too scratchy to eat raw in salads. Radish greens tend to trap lots of dirt, so swish them around in plenty of cool water before cooking. At the market, look for radishes with the greens attached, even if you don’t intend to eat them. The tops are a good way to gauge how fresh the radishes themselves are. Don’t worry about a little dirt clinging to the roots, but be wary of any signs of splitting or any particularly hard spots. These are signs that the radishes are a bit too mature and have gotten woody. At home, cut the tops off and store them separately (if you intend to eat them). The greens will keep in a plastic bag, wrapped loosely in a paper towel, for about a week. The roots will keep for a couple of weeks in a plastic bag. It is generally best to wait to wash vegetables until just before you plan to eat them, yet a bowl of washed and trimmed radishes in the fridge, just ready and waiting to be popped into your mouth, is a great thing to have in the summer. They’ll dry out a little this way, but the convenience is worth it. Daikon radishes are definitely one of those vegetables that might have you asking, “What do I do with it?” As manager of the Onamia Area Farmers Market, Carrie Boyd has this answer for you. Toss the daikon with the salt in a bowl. Cover and refrigerate for about 30 minutes, until they have released some liquid. Drain and pat dry. Stir together remaining ingredients and toss with radishes. Cover and refrigerate at least 8 hours. This article is an excerpt from Minnesota Farmers Market Cookbook: A Guide to Selecting and Preparing the Best Local Produce (Voyageur Press). Come chat with the author this Sunday, July 6th, at the Linden Hills Farmers Market, where she'll be signing copies of her book and talking about seasonal eats. 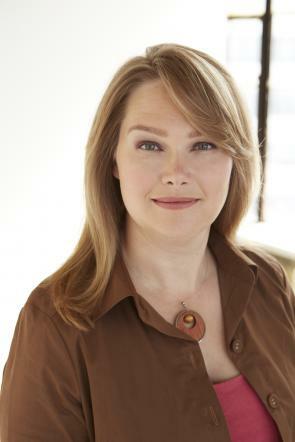 Tricia Cornell is a Minneapolis writer who contributes to the food blog The Heavy Table. She the author of a number of books on local travel and food.